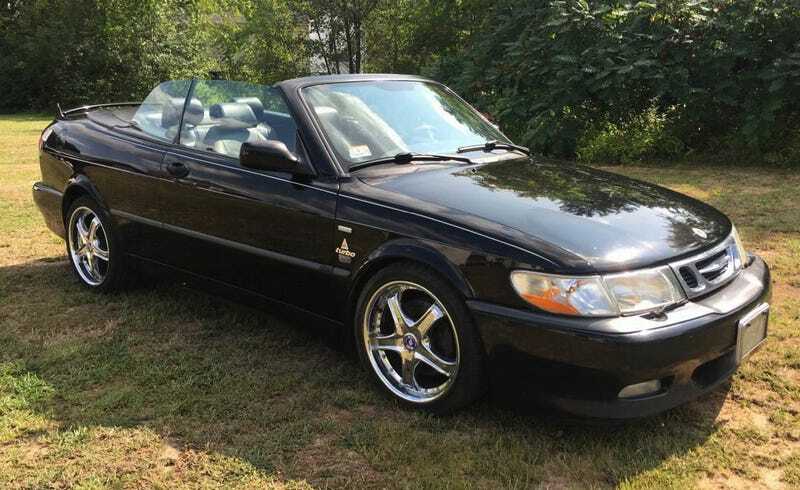 For $2,200, Would You Buy This Friggin’ 2001 Saab 9-3 Viggen? Today’s Nice Price or Crack Pipe Saab has an ouchie—one of its alloy wheels needs fixing/replacing. That’s easy enough, but let’s see if the rest of the car comes with a price tag that has you wincing in pain. Have you ever gone to a movie and had it turn out to be completely different from your expectations? I mean like, who knew that “IT” wasn’t an lighthearted comedy about office tech support? Color me embarrassed and confused about that one. I had a similar experience when I saw the vote tally for yesterday’s 1972 Renault Dinalpin A110, which as you’ll recall was a very rare edition. It was built in Mexico in collaboration with that country’s Diesel Nacional (DINA) mostly to get around import tariffs. Carrying the Mexican flag and sporting what was said to be a reasonably fresh restoration (although not exactly looking the part in the latter case), that car seemed to me to be nominally worth its $55,000US asking. That’s why its 58 percent Crack Pipe loss proved so surprising. You know what else is surprising—albeit in a good way? Why that’s right, it’s finding a car like today’s 2001 Saab 9-3 Viggen for sale. Whoopee! Now, as we all know, “Viggen” in Swedish means Thunderbolt. That’s derived from the word Vigg which means “bolt,” and um, apparently also “tufted duck.” This Viggen was named for the Saab 37 Viggen fighter jet, much in the same way that Ford’s Mustang supposedly feted the North American P-51. The OG 9-3 was of course an Opel underneath as it rode on the GM2900 platform shared with that German company’s Vectra and various other meh models. Those included the Saturn L here in the U.S.. I know; unclean, unclean! That all came after GM took a controlling interest in the Swedish car maker and proceeded to turn it into a team player rather than an individual standout. The resulting infusion of cash and a seemingly limitless parts bin did free up Saab to make the 9-3 Viggen, a high performance edition that the company offered from 1999 to 2002. This one falls on this century’s side of that production run and comes with both a B235R turbo four underhood, and a five-speed stick. The former’s use of that fat snail coaxed 230 horsepower from the DOHC 2.3, while the latter’s unequal length half-shafts encouraged all that horsepower to drive you into a tree. According to Wikipedia, this convertible Viggen is one of only 738 built for the 2001 model year. It’s done 170,000 miles since leaving Uusikaupunki (the convertibles were built by Valmet Automotive in Finland, not at Trollhättan), and comes with a bad wheel. It still has three good ones so the odds are in its favor. Now, while they seem to carry Saab center caps, I’m not placing those wheels as factory alloys. Maybe one of you Saabaphiles can enlighten us as to the genus and species. The issue with the left-front paw is a crack in the rim. According to the ad that’s bad enough to require the space saver spare for the drive home. He suggests a weld, I recommend a new set of wheels. Non-chrome, please. The rest of the car looks serviceable but tired. The black paint looks to be in serious need of a clay bar while the interior could sure benefit from some love for the leather. Overall it’s not bad, and there doesn’t seem to be any egregious flaws either outside or in. I’d ask about the need for the plastic in the driver’s side footwell however. What’s that all about? The engine compartment is reasonably clean, however this looks to be a car that someone has owned and used rather than babied. The ad says it “runs and drives good,” but then again, of course it does. Much like male genitalia in mainstream movies, we don’t get to see the top erect, but if it was flawed I would expect the seller would have mentioned it in the ad. One visual malady that should be addressed (along with the chrome wheels) is a freakishly large bumper sticker out back that’s advertising some sort of Brazilian Jiu Jitsu studio. Hello Goof-Off®! I’ve always lived by the motto, live fast, die young, and leave a good-looking corpse. Now, Saab is presently dead, and while we may eventually zombie Saab rising from the grave, right now we just have its rare offspring to remind us of what once was. This 9-3 Viggen isn’t pure Saab distillate, but it’s once of the most interesting of the GM era offerings. It may be wounded, with that wheel issue and all, but it’s far from down for the count. It’s also $2,200. It’s Friday so let’s get right to the vote for this car and that price. What do you think, is this spare-wearing Saab worth $2,200? Or, in its present condition, is this a Swede in desperate need of a lower price? Worcester, MA Craigslist, or go here if the ad disappears. H/T to Beans95 for the hookup! For $55,000, Could This 1972 Renault Dinalpin A110 Have You Shouting ¡Ay Caramba! ?